A covered bridge in downtown Woodstock. All photos by Berit Baugher. Gentedimontagna editor Berit Baugher escaped NY's 2016 blizzard for an idyllic winter weekend at Woodstock Inn & Resort in Vermont's Green Mountains. 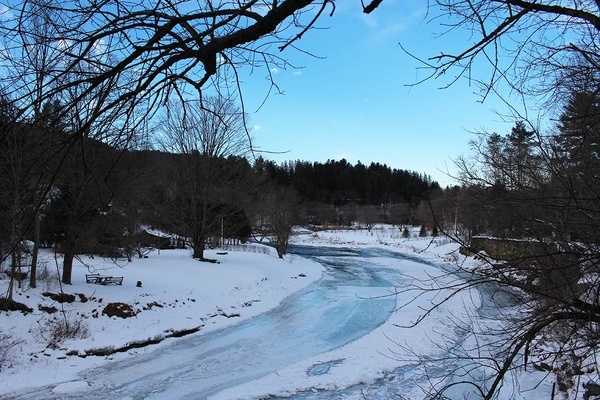 WOODSTOCK, Vermont – Once the holidays pass and the decorations come down, winter in New York City can feel like an endless game of dodging the elements. 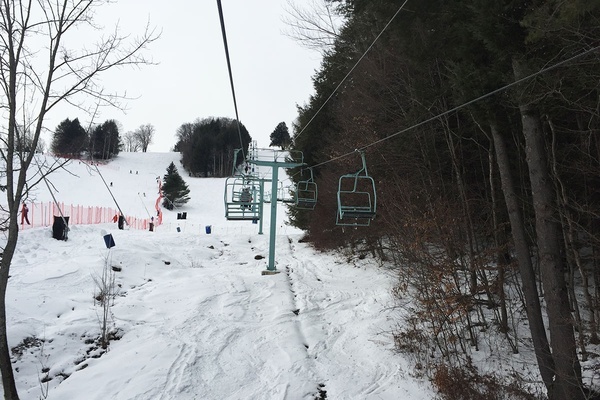 This year I got smart and planned a long weekend in Woodstock, Vermont, where a fresh coat of snow is cause for celebration and the natural surroundings entice you to spend time outdoors. 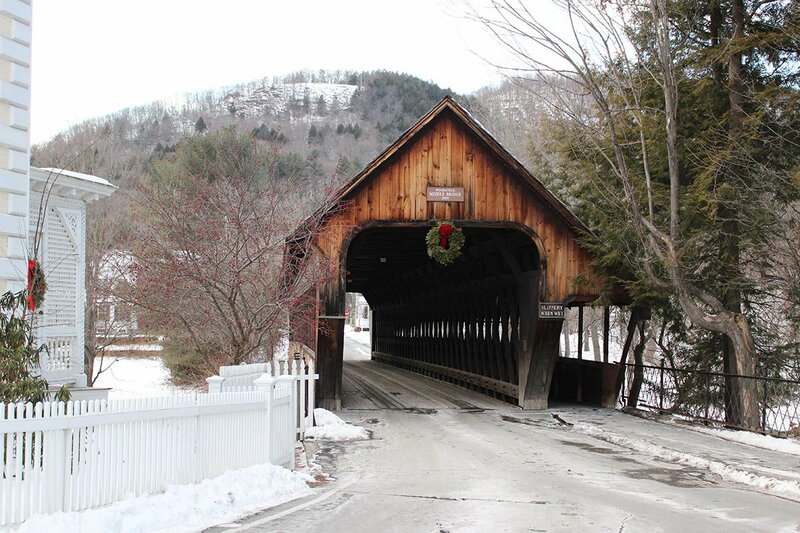 Frequently referred to as "the prettiest small town in America," the picturesque New England village has covered bridges and historic homes. was Vermont's first winter resort, with families visiting from Boston and Montreal to ski the surrounding Green Mountains. The current incarnation of the inn dates back to 1960s, but its roots can be traced to a local tavern and boarding house that opened in 1793. 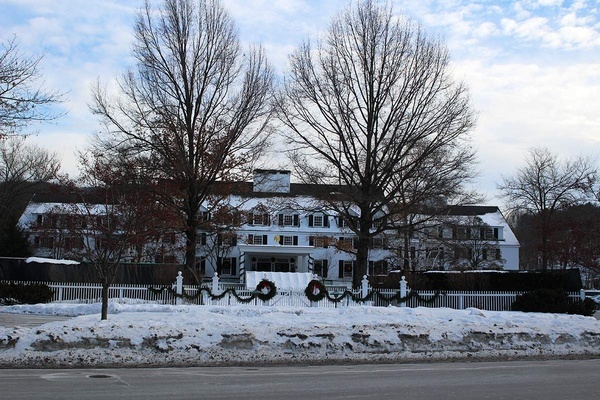 The inn is currently undergoing a series of renovations to continue modernizing the older structure and maintain its historic reputation. From to , most everything of historic importance in Woodstock has been preserved in part through the conservation efforts of . The duo left an undisputable mark on the small town, including the inn, which they purchased and rebuilt in 1969. Today it is owned and operated by , an organization the pair started to promote conservation, sustainable land use, and American heritage. One of many frozen rivers. 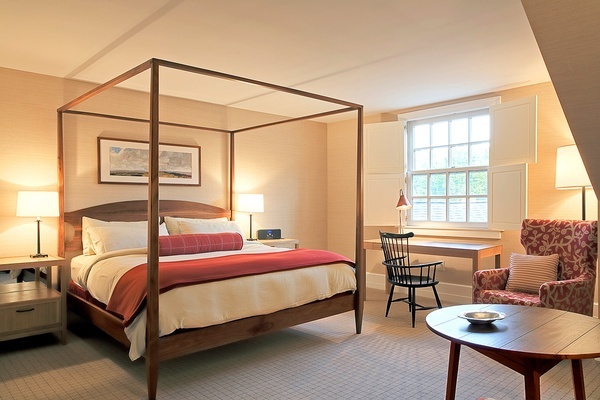 A guestroom at Woodstock Inn & Resort. Photo courtesy of Woodstock Inn & Resort. The hotel is much larger than it appears, with a footprint that spans across the small village. In addition to guestrooms and restaurants, the main building has various seating areas that serve afternoon tea and daily wine and cheese happy hour. There's also a game room with shuffleboard, Pacman, and other fun distractions for kids. Attached to the hotel is a 10,000 square foot spa that overlooks the outdoor swimming pool. I spent an early evening there, recuperating after a day outside with an incredible deep tissue massage. The freshly baked lavender macaron at the end of the treatment was just the pick me up I needed to get me to dinner. I also recommend making time for the eucalyptus steam room — the combination of essential oil and heat is energizing. I visited during peak ski season so most of my time was spent navigating the terrain on , the hotel's family-friendly mountain. After a fifteen-year skiing hiatus, I dedicated the weekend to relearning the sport. I'm happy to report that with the help of an instructor it was like riding a bike. is a quick drive or shuttle ride from the hotel and houses an indoor swimming pool, tennis and racquetball courts, and a gym. In warmer months, , a full-service golf club just down the road, has an 18-hole course with beautiful views of the surrounding Kedron Valley. The rooms are simple and cozy with a country-chic aesthetic that speaks to the town's rustic environment. Four-poster mahogany beds are covered with hand-dyed wool blankets. 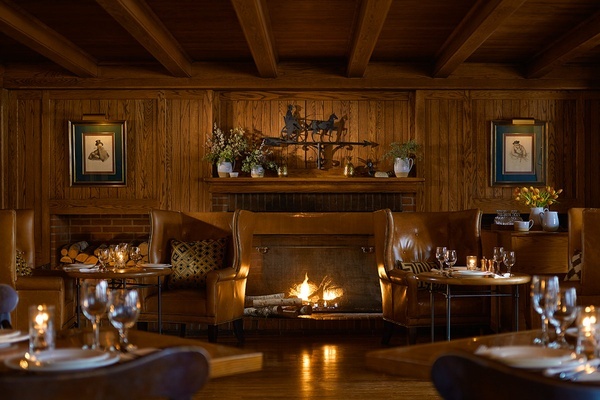 Tavern wing guestrooms have wood-burning fireplaces. Families traveling with dogs are welcome — they just need to request a garden level room. What's great about the hotel's location is its proximity to downtown Woodstock's many restaurants. That being said, there is really no reason to venture outside the hotel grounds. Between and , I found delicious options for every meal. A casual buffet-style breakfast is served each morning at The Red Rooster Restaurant along with an informal lunch. After 6 p.m. it turns into a fine-dining restaurant with a menu using many of Vermont's seasonal produce offerings. Richardson's Tavern was my favorite of the two, with great food and drinks served in what looks like an old-world English pub. A romantic country escape from nearby cities like Boston and New York or a long weekend for families with young children. Anyone looking for an active nightlife scene or the hustle and bustle of a busy downtown. The ride up Suicide Six. 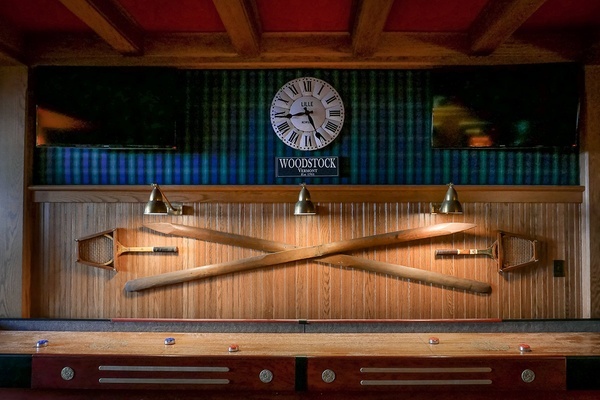 The game room at Woodstock Inn & Resort. Photo courtesy of Woodstock Inn & Resort. Richardson's Tavern. Photo courtesy of Woodstock Inn & Resort. 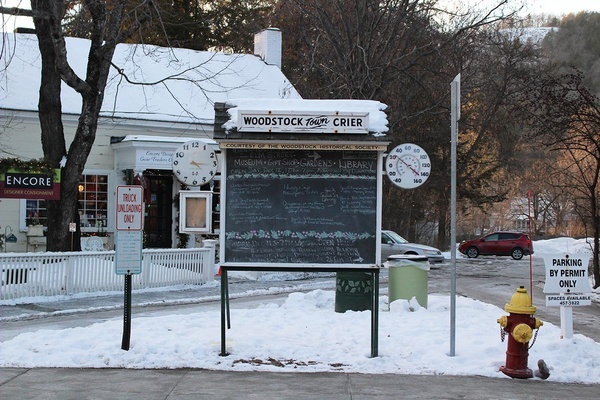 Woodstock looks exactly like what you'd imagine (and hope) a small New England village would. Rolling hills and winding rivers make way for a charming and walkable downtown with shops and restaurants that will keep you busy when you're not enjoying the hotel or ski slopes. Some of my favorite finds were a bit further afield and require a short drive. On our drive up from New York City, we stopped for lunch at the flagship in nearby Quechee. In addition to showcasing the company's elegant handcrafted glass and dinnerware, there's a beautiful restaurant serving vibrant salads made with local produce and a Vermont cheddar soup that I'm still dreaming about. Glassblowing demonstrations (downstairs) entranced me for a good half hour. For souvenirs, I went straight to to buy a piece of handcrafted stoneware dipped in a milky white glaze. Designed for everyday use, the rustic looking and are a nice reminder of a lovely weekend, while the set make a thoughtful gift. , better know as Gillinghams, is more than a local general store — it is a local institution. The family run shop has been around since 1886 and is a reliable spot for anything you might have forgotten to pack — from basics like ski socks and batteries, to more unusual items like fly fishing flies and wilderness survival gear. I stopped by to peruse the largest assortment of maple syrup in town. is where I would shop if I were renting a house in the area or planning a summer picnic. The gourmet grocer is chock full of fresh produce, charcuterie, and variety of cheeses, including the waxed blocks of cheddar made at nearby . Swing by for a specialty sandwich. I ordered the Moonlight in Vermont (roast turkey, Vermont cheddar, apple slices, and lettuce on sourdough) and couldn't have been happier. Regretfully, I wasn't able to squeeze in dinner at , the local bistro that was mentioned in every article I read about Woodstock. I stopped in for a glass of white wine and instead was totally charmed by the dark wood interiors and delicious smells wafting in from the kitchen. It's on my list for next time along with a burger at and a nice Italian dinner at . 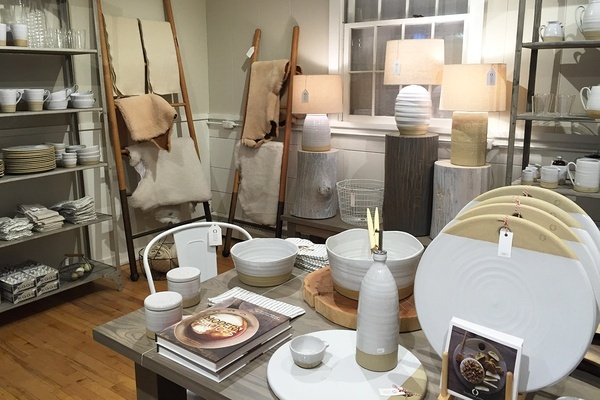 The goods at Farmhouse Pottery. F.H. 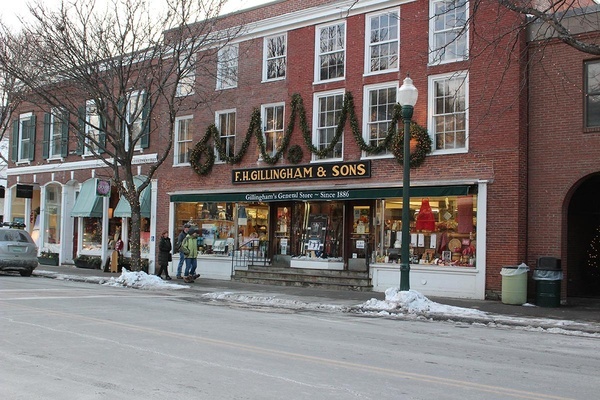 Gillingham & Sons, a downtown Woodstock institution. (LEB) in New Hampshire is the closest airport and a 25-minute drive from the hotel. Daily commercial flights from Boston and White Plains, New York are offered through . (MHT) and (BTV) are both an hour and half drive and have a larger selection of incoming flights. Woodstock is a little over two hours by car from Boston and a five-hour drive from New York City. Downtown Woodstock is a short walk from the hotel. Taxi and shuttle service are available through the hotel for further distances, but having your own car is the easiest and best option for getting around. Parking is readily available at the hotel and ski slopes. У нашей организации полезный интернет-сайт с информацией про шторы короткие.